While working at the McGrath Farm Site with a group of graduate students and undergraduate volunteers, we made an interesting discovery. While our Friday afternoons are spent working in Operations 1 and 3 with the undergraduate students, we’ve spent many Saturdays this fall working with a team of volunteers (including occasional visits from a class of high school students from the Concord Academy) in Operation 6. Operation 6 lies in the southern portion of the property in a relatively flat area covered in weeds. We know that a railroad line used to run through the southern end of the property on a roughly east-west orientation. Recently, we have found what we believe to be evidence of railroad activity in the form of coal and slag deposits that have been cropping up in a few of our units. On Saturday, our suspicions were confirmed when Brandeis University graduate student, Sarah Schofield-Mansur found a round copper-alloy artifact (see below). 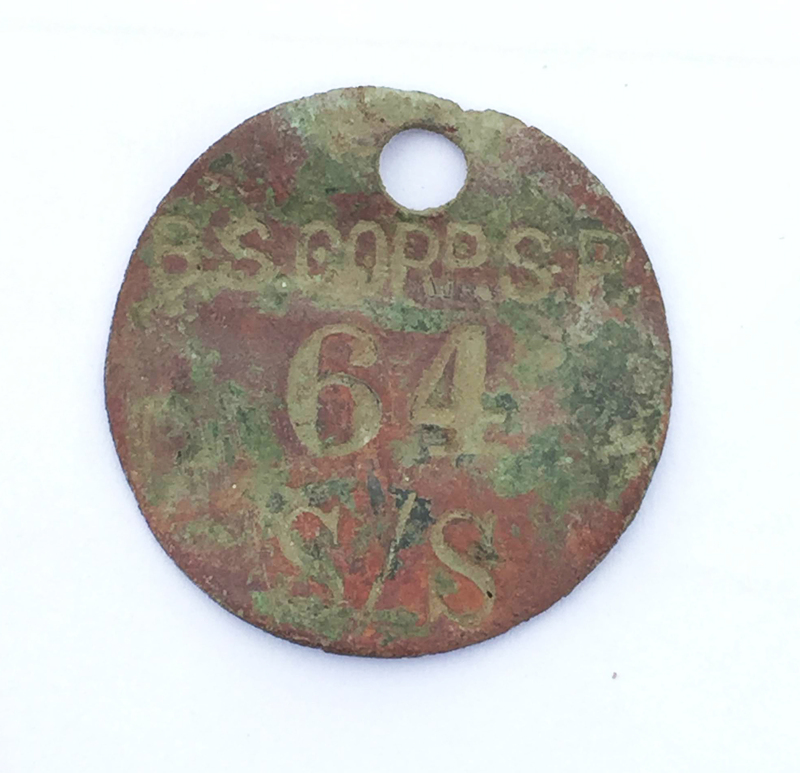 We initially believed the artifact was associated with the railroad in some capacity, but we weren’t entirely sure how. After doing some internet research, we determined that this was a tool check used by an employee of the Bethlehem Shipbuilding Corporation. Employees would be assigned one (or more?) of these; the number in the center identified the tag’s owner. We’re unsure what the “S/S” designation indicated, but we suspect it was used to indicate a department or division in which the employee worked. When the employee required a tool, he would take the tool and hang his tool check on a pegboard in a spot indicating which tool was taken. It was a basic system for tracking company property. The “B.S. CORP.” stamp under the perforation is the abbreviation for the Bethlehem Shipbuilding Corporation. The next two letters, which appear to be either “S.F.” or “S.P.,” likely indicate the specific branch of the corporation at which the owner of this tool check was employed (here is a similar tool check for sale on eBay–note the letters “F.R.W.” that indicate that the owner worked at the Fore River Works in Quincy, MA). The Bethlehem Shipbuilding Corporation was created when the Bethlehem Steel Corporation purchased the Union Iron Works in San Francisco (“S.F.”?) in 1905. They also had a branch in Sparrows Point, MD (“S.P.”?) that opened in 1914 and served as the company’s headquarters beginning in 1964. We’re hopeful that the last two letters on the tag will be clear once we’ve gotten the artifact cleaned up in the lab.